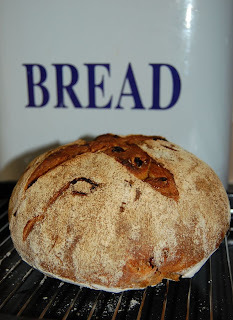 Really, I looked in the cupboard and thought, “I ought to use those sunflower seeds, and oh there’s a little packet of cranberries which has been there for a while”, and the dough part was pretty much standard sourdough, just with those bits (and a desert spoonful of black treacle) added. Just tried a bit of it earlier, and it is rather good – probably be nice with both marmelade/jam or a decent cheese I hope. This entry was posted in sourdough. Bookmark the permalink.